Are you sweet tooth person? 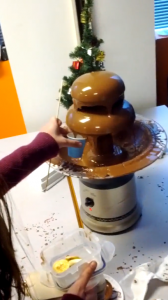 On Dec 27, EC Vancouver English School had a chocolate fondue party. Take a look at the picture! It still looks delicious! Americans first enjoyed fondue of the Swiss variety, which is the classic cheese fondue served with crusty bread. 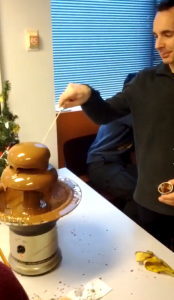 The french name fondue is “fondre”, it means “to melt” or “to dissolve”. What about enjoying fondue, today? It’ll make you happy.